Picture this: You’re standing in a store aisle, one kid tugging at your shirt complaining she’s starving, the other kid’s fiercely fighting the shopping cart buckle – screaming because you won’t hand over your iphone for him to play games. 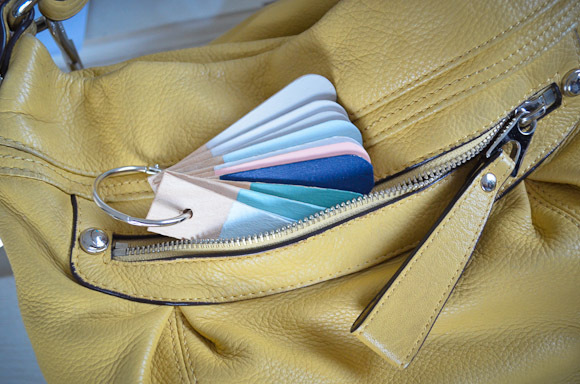 You just found a smokin’ deal on that thing you’ve been hunting for… but is it the right color?! Do you know that color memory is actually one of the least reliable recalls we have? 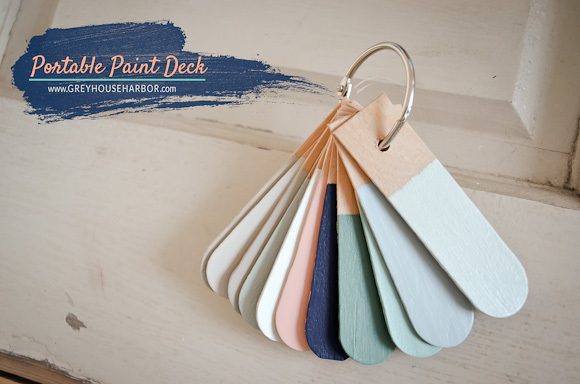 Tired of buying home accessories only to end up returning them because they were slightly the wrong hue, I decided to put together a portable paint deck of all the colors I’ve used in our home. You can, too! 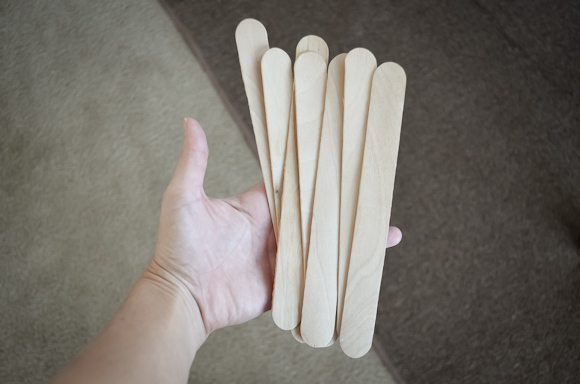 Buy large craft sticks – these can be found at Walmart, Hobby Lobby, Michaels, etc. 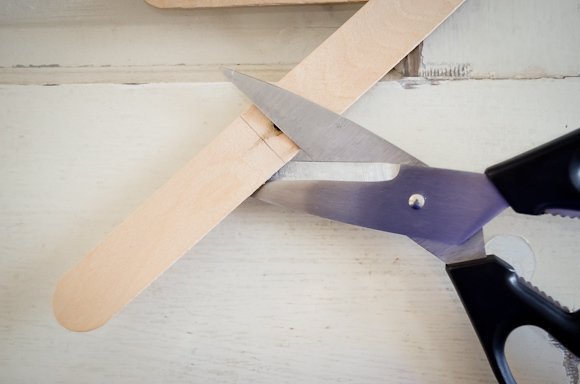 Using sturdy kitchen scissors, cut the sticks about 3.5″ long. 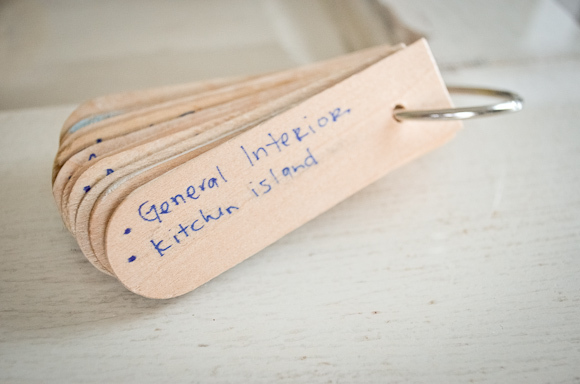 To ensure they are all the same length, use your first stick as a template to mark the rest. 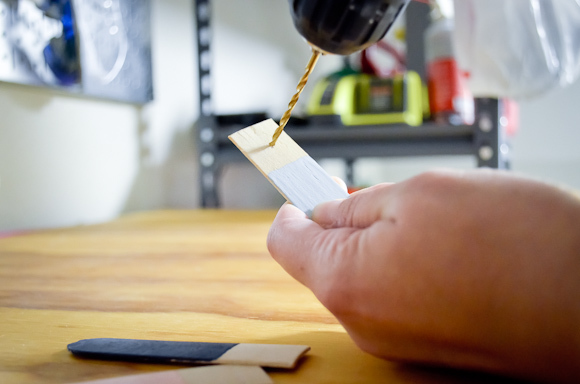 Drill a hole 3/4″ down from the cut side. Even though mine are already painted, I’d recommend not painting them before drilling. That way, if one cracks, you haven’t wasted your time. 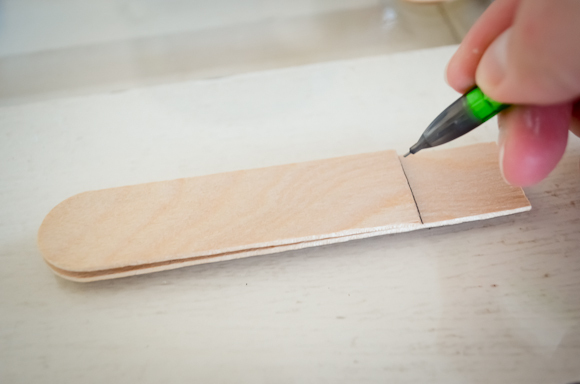 Again, use the first hole as a template to drill through the others. Drill holes in more sticks than you need. 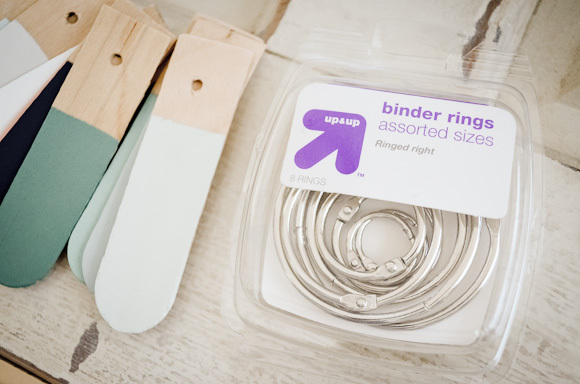 That way you can have “blanks” to easily paint new swatches as you continue adding color to rooms. 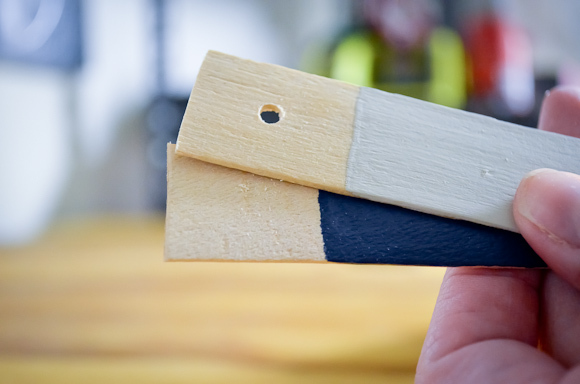 Gather your house colors and paint the stick ends on just one side. Do 2 coats for adequate coverage. Let dry. Loop your painted sticks on and label the back sides for reference. 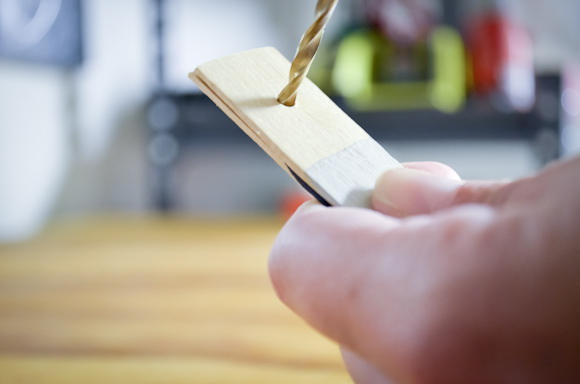 Smaller, regular-sized Popsicle sticks could work also. However, I found it more difficult to hand-write info on them. 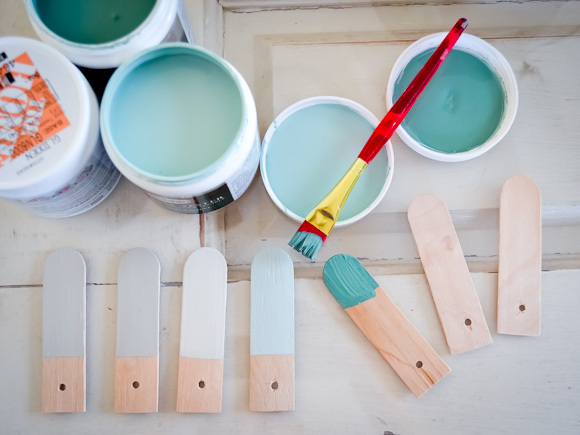 You don’t have to be flustered by demanding kids to benefit from a personal portable paint deck! This baby stays tucked in my purse and has already saved me from a handful of wayward purchases. The painting continues! When Handsome and I got to the stairwells, we were a little perplexed. Even with his 6’3″ height and an extension pole, how on earth do you cut in and finish spaces like this massively tall stairwell? Hire a painter at $30/hour? Rent scaffolding at $50/day? After a quick YouTube search, a trip to Home Depot for a 2×6, and a neighbor’s borrowed extension ladder we were in business. Step 2. Secure extension ladder feet against the stairs. If pushed tight against the back of the step it will not slip. Step 3. Lean ladder against far wall and double check all ladder safety devices are set. Step 4. Use a second step ladder on the top landing, keeping its feet a few inches back from the step edge! Step 5. 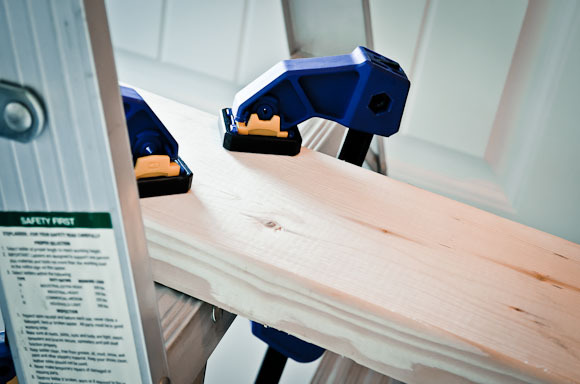 Lay one end of 2×6 lumber through the extension ladder. Double clamp the other end to the step ladder. We needed a 10ft board, but be sure to measure your distance to determine how long yours should be. Step 6. CAREFULLY climb the extension ladder and walk the plank to finish the job. The contractor guy on YouTube said this was safe so that’s gotta be true, right?! 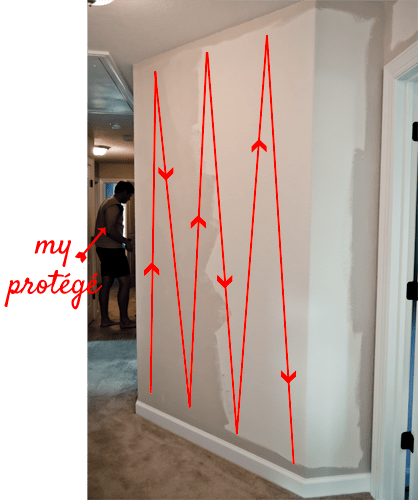 Our front zig-zag stairwell landings were too narrow to fully open the step ladder, but leaning it against the wall worked just as well. This technique is NOT for the faint of heart or clumsy. I tried to research just how much weight a 2×6 can handle before it snaps, but had little success coming up with a concrete number. My girlish figure of 140lbs slightly bowed the beam and it did spring a little when I walked, but was no where near breaking and never felt unsafe. (Did I just tattle my weight for the world to know?! 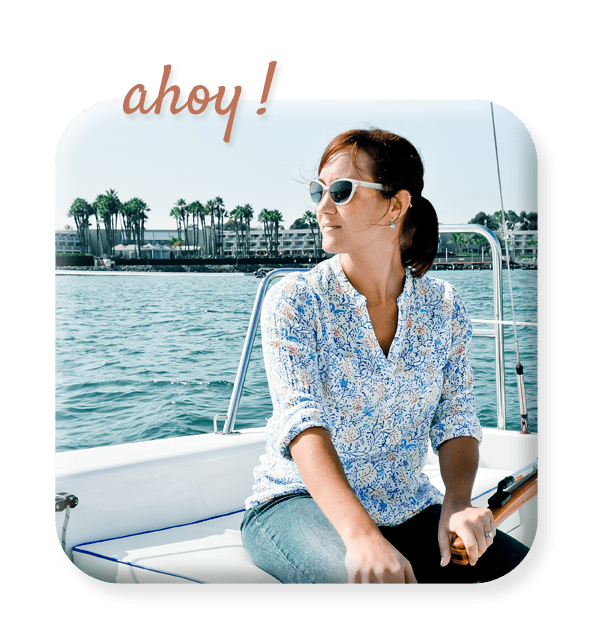 In the interest of safety… yes, yes I did.) Best to do a trial run very low to the ground before attempting this up high. $7 for lumber and some sweat equity – that’s what I’m talkin’ about! Now go forth and conquer those impossible spaces, my friends. And if you missed any of the previous proper painting posts, you can find them all HERE. Disclaimer: Please use extreme caution and common sense. I claim no responsibility for botched or mishandled plank walking!